A project board can go by many other names, such as steering group or steering committee. If you're a project manager, you'll find it can provide the management support to get the job done. 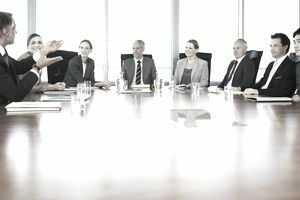 The project board is chaired by the project sponsor and typically includes a number of other senior stakeholders as well as the project manager. These are the key people who have the ability to get things done on the project. Their job is to oversee the project and keep it moving in the right direction. Project boards are set up at the beginning of the project lifecycle and operate until it's completed. It has four key roles. The project board has oversight responsibility for the work that the project team is carrying out. It ensures that policies are adhered to at the corporate level and the program level. The members of the board are accountable for the successful delivery of the project. This governance role ensures that the project team is acting in ways that are ethical and are acceptable to the company. There are often decisions to be made on a project that fall outside of the remit of the project manager. That decision needs to be discussed with a number of stakeholders. The issue will go to the project board. The board's role overall here is to keep the project on course by providing the appropriate direction for the team. They contribute to setting the vision at the start of the project and keep the project on track throughout. The project manager is the key person who provides the needed information. The rest of the board is there to provide help and support. The project board is primarily a decision-making body. Their role is to keep the project moving forward by solving problems that can block its progress and helping the project manager see a clear route to successful completion. The board may accept the project manager’s recommendation. Or it may come up with other suggestions for a way forward. The board's value is that its members collectively have the big picture. The project board approves the overall budget. It doesn't usually demand to see every invoice but it monitors ongoing spending to ensure it stays on track. The project manager goes to the board when it looks like it's time to dip into contingency funds or management reserves. The board can authorize overspends and access additional funds when it can be justified. Overall, the project board provides an essential governance and steering function for the project team. Its direction and advice help the project manager keep the project moving in the right direction, and it is perfectly placed to step in and help if anything starts to go wrong.